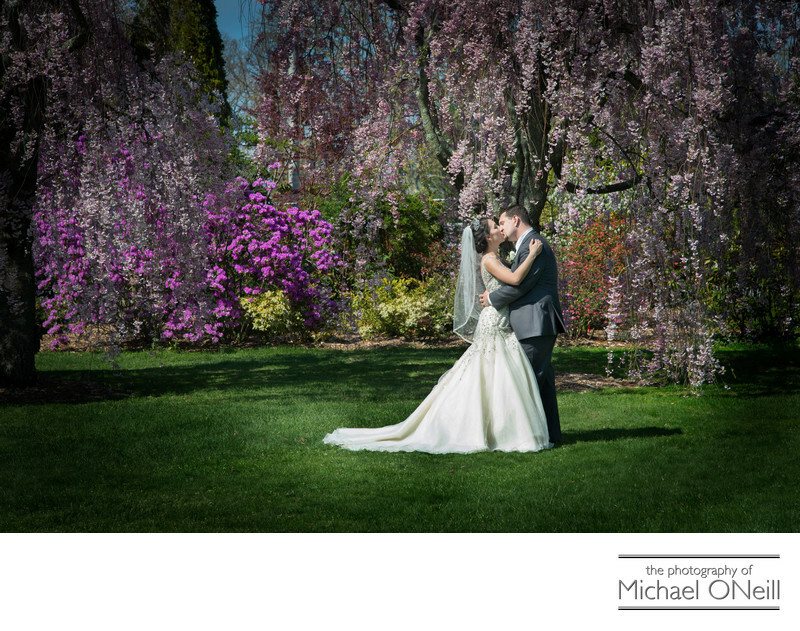 This beautiful spring time wedding picture was taken at an amazing Long Island location that is one of the best kept secrets around. While other popular locations will be filled with a half dozen wedding parties at one time, this perfectly planted and manicured multi-acre garden is reserved for just one bridal party at a time. We started our day with the bride’s preparations at her home in the Williamsburg area of Brooklyn, New York. We then travelled to this wonderful garden where the reveal took place...when the groom got to see his bride in her wedding dress for the very first time. After that emotional moment we created some great wedding photographs of the bridal party and the families of the bride and groom and finished up at this awesome spot by wandering around all of the beautifully planted and maintained acres of flowers, specimen trees and unique architectural structures. Following this photo session we travelled to The Venetian Yacht Club in Babylon, NY for an outdoor wedding ceremony on the waterfront of The Great South Bay, followed by an amazing cocktail hour and dinner reception overlooking the water.